Tungsten Carbide (TC) is harder than stainless steel. 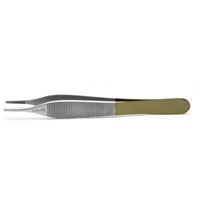 Surgical instruments with tungsten carbide inserts in the tip offer a stronger grip, and they last longer. Tungsten carbide instruments generally have golden handles.